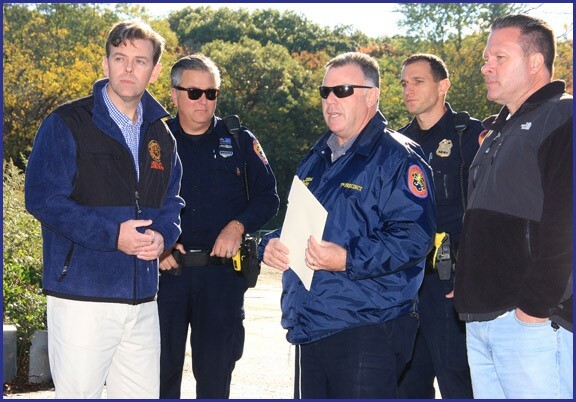 In light of recent events in the Massapequa Preserve, Nassau County Legislator James D. Kennedy met with police officers from the 7th precinct as well as community residents, to discuss safety and security concerns. As a result, additional police measures have been put into place within the preserve, including undercover plainclothes officers and bicycle patrols. New signs in the area, created in conjunction with the Kiwanis Club of the Massapequas, ask residents to “see something, text something”. Legislator Kennedy is asking the public to remain on alert and to contact law enforcement if they see anything unusual or suspicious in the preserve and the community as a whole. Shown in photo above, left to right: Legislator Kennedy, Officer Christopher Jackson, POP Officer Bill Taylor, Sargent James Pettenato and Greg Mangino.